This size, however, is deceptive. The rugged terrain and poor roads mean that distance isn’t measured in kilometres but in hours. In two days we’ll travel to Jaco Island at Timor’s eastern tip. The 223km one-way journey generally takes 8-10 hours. In the rainy season, the roads might be impassable. But because June’s the start of the dry season, we’ll hopefully bump along in our rented four-wheel drive at a relatively rapid 28 km/hour. My first impression when I flew over the country nearly 15 months ago was the mountainous terrain. Looking down, I was reminded of the crumpled back country between Mt Taranaki and Mt Ruapehu. Some of Timor’s mountains outdo our own. Mt Ramelau, her grandest peak at 2986m, soars higher than Ruapehu which dominates the central North Island. Last year we climbed the second highest mountain, Matebian (2315m), a four-hour vertical slog, for spectacular views to the coasts on both sides of the island. From the top on a clear night, they say, you can see the lights of Darwin, around 650km to the south. 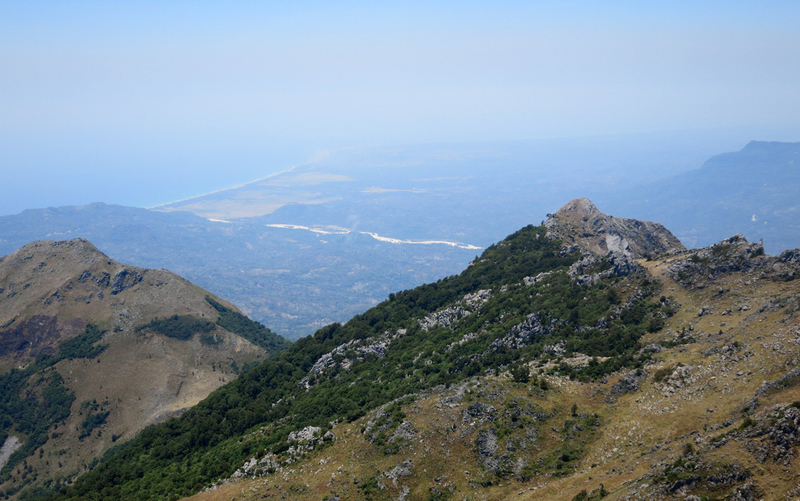 Timor’s north coast from the top of 2315-metre Mt Matebian. For a Kiwi, it seems odd that these peaks never see snow. North of Wellington, 1529-metre Mt Hector, the highest point of the southern Tararuas, glistens white for more than six months a year. We were 800 metres higher on Matebian in October and got nothing more than a cool breeze. In 1861, during one of his many voyages through the region, naturalist Alfred Russel Wallace, a colleague of Charles Darwin’s, saw advantages for cultivation in this terrain. In The Malay Archipelago, Wallace wrote that rice grows well on Timor’s marshy coastal flats, maize thrives in the lowlands, and the coffee grown is of ‘very superior quality’. Two to four thousand feet up in the mountains, ‘there is a much moister atmosphere so that potatoes and other European products can be grown all the year round’.’ These different climate zones are an advantage that Timor-Leste still enjoys over other tropical lands. 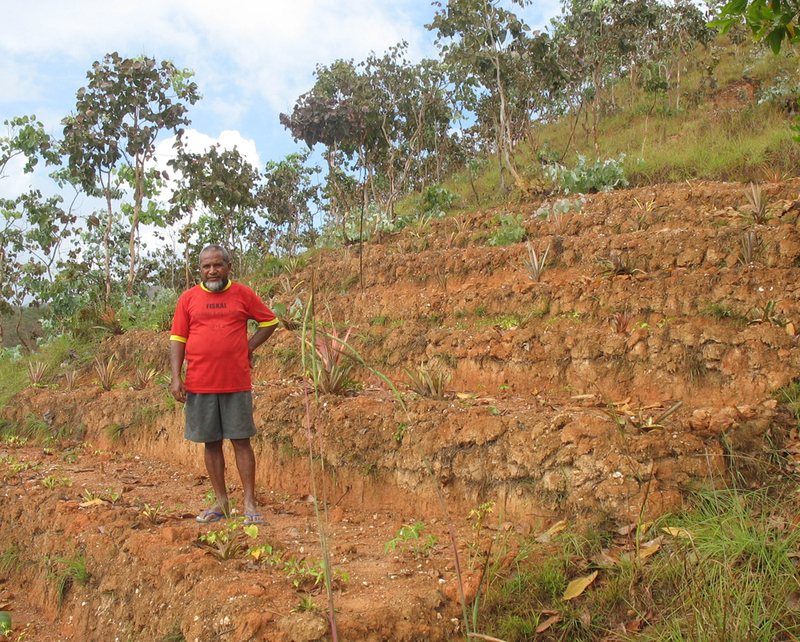 Aileu farmer Manuel da Silva has terraced his red earth so he can grow cassava, pineapples and other crops. As any good fisherman knows, a rugged land generally means a rugged sea floor. 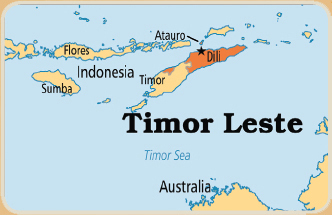 Timor’s hills fall away into extraordinarily deep seas. Atauro Island lies 30 km north of Dili. Visible to the northwest are the Indonesian islands of Alor and, to the northeast, Wetar. 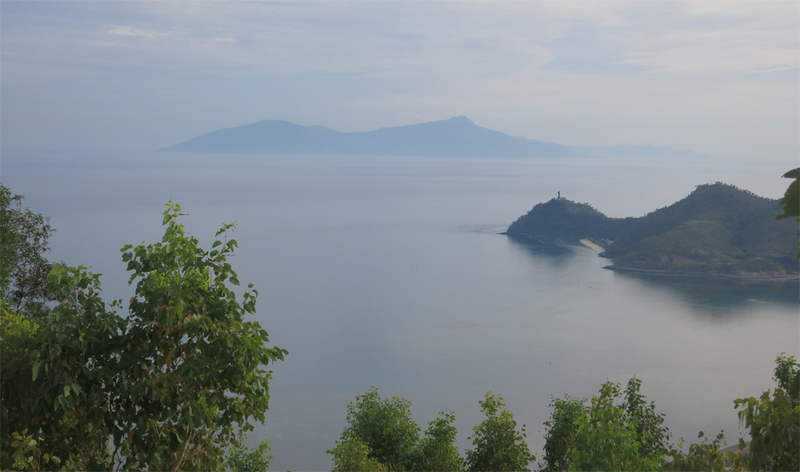 The strait that separates them all from Timor is nearly 3 km deep. Atauro Island, 30km north of Dili, is separated by a channel 3km deep. This was a factor in the Indonesian invasion in 1975. The channel provides an access route between the Pacific and Indian Oceans so deep that nuclear submarines can’t be detected. When President Gerald Ford and Henry Kissinger met Indonesian President Suharto two days before the invasion, this was among their strategic concerns. The last thing the Americans wanted was an independent, leftist Timor controlling the strait. The Indonesians left the meeting satisfied they had the green light to invade. The seas around Timor – the Banda Sea to the north and Timor Sea to the south – are not only deep but warm. In Dili Harbour, the January temperature is just under 30ºC. Even in June, the water temperature nudges just over 28º, more than twice Wellington Harbour at the same time of year. At the height of summer, the waters of Oriental Bay, Wellington’s Riviera of the South, barely reach 16º. But while these chilly waters might bite, at least they don’t have teeth. Snorkeling in Wellington Harbour, I’ve never felt the urge to twist around to see if a crocodile’s lurking. A couple of crocs have been spotted off Dili Harbour in recent weeks, taking some of the fun out of our regular Sunday snorkeling at the beach behind Cristu Rei. The dry season has arrived and already the hills around Dili are turning brown. By November after four months of virtually no rain, the land will be baking. When we first arrived, I’d expected to see dense tropical jungle. But we live on the drier, northern side of the island. While there’s lush forest further inland and in pockets along the coast, more typical on the Dili hills are scrub and eucalypts, their white leaves crunching underfoot. 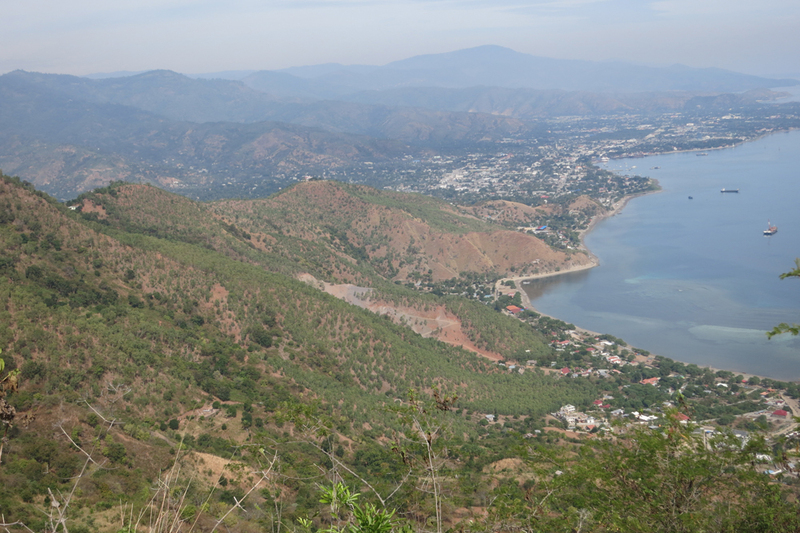 Looking back on Dili from the hills to the east, which are already dry. The burnt red earth that characterizes parts of Timor and endless tracts of northern Australia lies in a climate zone known as ‘tropical savannah’. Geologically, Timor is part of Australia. According to a group of Melbourne University scientists, it sits on the leading edge of the north-west shelf of the Australian continental crust and has moved more than 100km in the past two million years. On the other hand, Atauro Island belongs politically to Timor but geologically it’s one gem in the necklace of over 18,000 Indonesian islands. Many are volcanic. Although Atauro’s volcanoes are extinct, the island is creeping south as two vast tectonic plates collide: the deep trench between Atauro and Timor marks one point where the Pacific plate is subducting, or sliding under, the Indo-Australian plate. Timor’s rocks might be ancient and settled but they’re frequently shaken by Indonesia’s earthquakes and volcanoes. We’ve had several tremors since we’ve been here, all originating in the Indonesian arc of the Pacific Ring of Fire. We’re getting used to people running outside, shouting and banging pots and pans after each one. ‘To let God know we’re still alive,’ is one explanation we’ve been given. ‘To scare the spirits back underground’ is another. Dili temperatures rarely go beyond the mid-30s but the sticky heat around Christmas is pretty unbearable. June’s dryness has brought a welcome lack of humidity. Although we live just 953 km south of the equator, it’s also slightly cooler. Last year in mid-winter, we’d wake to Timorese families huddling around fires to warm themselves in the nippy 23º morning air. 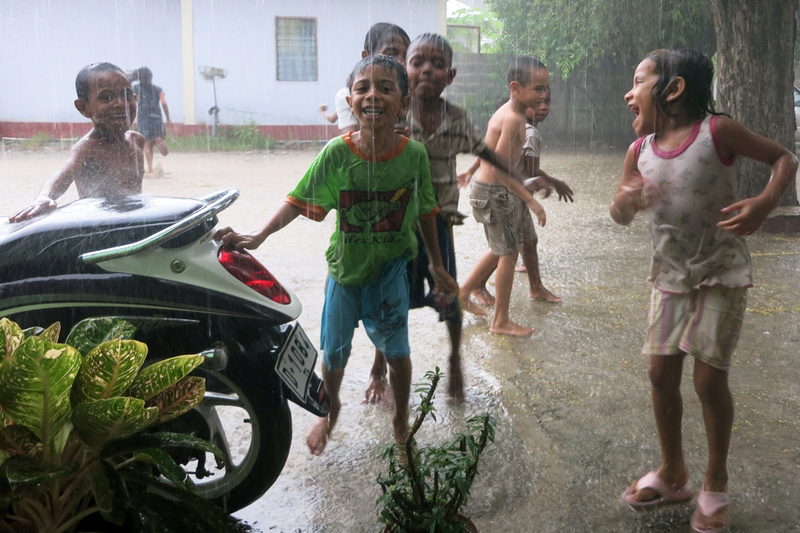 These neighbourhood kids were happy to see the wet-season rains arrive last November. A Timorese colleague who studied at Waikato University in New Zealand found it so cold when she arrived there in May that she ended up in hospital. Summer in Hamilton, one of our warmer cities, wasn’t much better, she says. We have the opposite problem of acclimatisation. In early June we had a barbecue at our place to farewell Karen, our VSA country manager. At a Wellington barbie, blokes huddle round the fire discussing the steak and sausages while secretly warming their hands. Here, the eucalypt embers just add to the sauna and everyone stands back. The last thing you want to do in Terra Timor is turn up the heat. 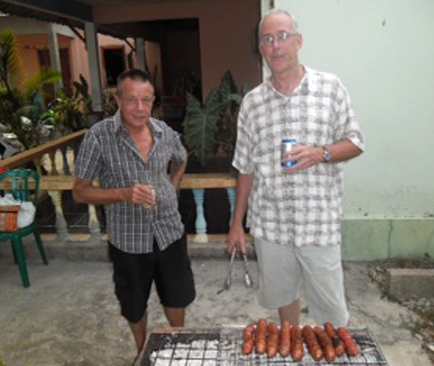 VSAer Doug Hosking (left) braves the heat to keep me company on the barbie. Postscript: I was a little hasty when I said June marks the start of the dry season. During our trip to Jaco Island on 19-22 June, we had 36 hours of almost continuous rain. It was so heavy that we didn’t actually make it to the island. We arrived in Tutuala, at the very eastern tip of Timor, to discover that the 5-km road down to the beach opposite Jaco had been washed out. Until then, the roads hadn’t been too bad. We had lunch at the Portuguese posada high on a bluff overlooking the ocean, but couldn’t even see Jaco through the mist and rain. The drive from Dili to Tutuala took around 7 hours all up. The bush in the region was notably more lush – not quite Amazon jungle, but certainly denser and greener than the scrub and eucalypt along the coast near Dili. This entry was posted in Geography and tagged Alfred Russel Wallace, Atauro Island, Australian continental shelf, Darwin, Dili blog, Mt Hector, Mt Matebian, Mt Ramelau, Pacific Ring of Fire, Timor blog, Timor climate, Timor geography, Timor Leste blog, Timor-Leste size, tropical savannah by Pat n Pip. Bookmark the permalink. I came across your blog as I researched TL. I’m planning a visit in January. I just want to thank you for posting such realistic and informative info plus great photos! Obrigada! Thanks Angelina… glad you find it useful. Fabulous story Pat! I too was amazed at the size of Timor Leste when I worked it out for Lower North Island supervisors and foremen here in a speech I did to promote VSA. That little booklet you gave me with the poems is really beautiful.